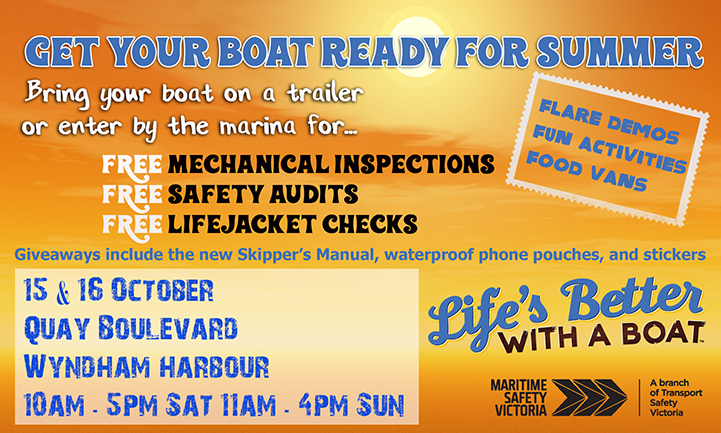 Wyndham Harbour plays host to Maritime Safety Victoria's Community Boating Safety Expo October 15-16. Director, Maritime Safety Peter Corcoran said local boaters will be treated to a range of boating safety activities including free safety checks on their vessels. "Boating is at the heart of the Wyndham community and this expo provides a one-stop-shop for boaters to get the right safety information for their boating needs. "Safety education is our prime concern at the expo, and it will be a chance for boaters to get their boats ready for the summer season. "Come along and see demonstrations of flare launching, fire-fighting, lifejacket servicing as well as get a free safety check done on your vessel. "We also have two marine mechanics who are offering free 20-point checks to help with maintenance queries. "It will be a warm and welcoming environment to get one-on-one attention plus latest information on boating safety requirements. "I'd recommend all boaters of every level of experience attend. Whether you are a novice or a lifelong boater – everyone can benefit from safety information," said Mr Corcoran. The Boating Safety Expo will be at Quay Boulevard in Werribee South between 10am and 5pm Saturday and 11am to 4pm Sunday. Boaters are encouraged to bring their vessels either by trailer or entering via the marina. Food and beverage vans and fun activities for children will make it a family friendly event. "The MSV team is looking forward to some really positive interaction with the Wyndham boating community," Mr Corcoran said.